Do you like foosball? I know I played my fairshare in college. Well, these engineering students at the University of Adelaide in Australia have taken a love of foosball to a new level. 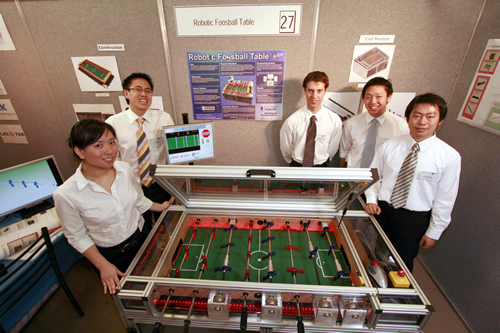 They have created an automated foosball table for those times where you have no one willing to get beat by you. The robotic foosball table features a 96 pinhole camera and LED motion sensing system. The machine houses a very basic artificial intelligence that makes decisions based upon ball position and the player’s moves. So don’t be surprised if this table can actually beat you. The students won the top award in the university’s mechatronics project competition. They are currently looking for sponsorship, so you can be seeing something like this in a pub/bar near you.